The simple answer is that these are abbreviations of some of the hottest topics in technology right now. They are all part of a family called Immersive Technologies and these allow the user to become fully immersed in a new world via various pieces of hardware. So let’s start with the one you have probably heard of: VR, which stands for Virtual Reality. By definition this typically refers to computer technologies that use software to generate a 3-dimensional realistic world of image, sound or sensations. Virtual Reality is nothing new; in fact it is first referenced in a science fiction story by Weinbaum in 1953. ‘Pygmalion’s Spectacles’ describes a goggle-based virtual reality system with holographic recordings of fictional events, including smell and touch… Did the author know something we didn’t?! The technology we see today is not that different of Weinbaum’s description however the concept of consumer virtual reality in entertainment pre-dates computer technologies and a mechanical version of VR was released called the Sensorama in 1962. This was then developed into the notable Aspen Movie Map in 1978 created at MIT and this was then labelled hypermedia. Move forward nearly 40 years and we have the headsets in the mass market. There are many out there, from mega expensive to almost free. Let’s start at the cheaper end of the market: In 2014 Google popularised the VR headset market by making it affordable with the Google cardboard. This was a cardboard headset that you inserted specific smartphones into which would create a VR 3D world. On some websites you could get them for a minimal $20, or even for free. The headsets then range right up to the Oculus Rift developed by Oculus VR. It was released in March 2016 and came onto the market at $599. The Rift has a stereoscopic OLED display with a high resolution and refresh rate for each eye. It also has integrated headphones with a 3D audio effect. These are very high-tech creating a totally different world. If you haven’t experienced VR then any of the headsets on the market will be hugely impactful on you. They are a huge amount of fun. However it looks like the bigger headsets like the Rift or PlayStation’s new VR headset will be moving from the gimmicky to the truly valuable. Next up is AR or Augmented Reality. AR is a live view of a physical real-world environment. Its elements are augmented by computer generated inputs including sound, images or GPS data. Again this is not a new technology and follows a similar history path to VR, however last year (2016) it was incorporated in to the biggest downloaded app in years. You guessed it… Nintendo’s Pokémon Go! I would be surprised if you hadn’t heard of it but Pokémon Go used the real world in a mobile phone game. It augments (or overlays) different creatures around the world in which you had to catch in 2016. Nintendo’s vision was to use this technology to get gamers out of their homes. Moving around and AR made this possible and turned Pokémon Go into a massive phenomenon. This moves us swiftly on to Mixed Reality (MR) which is often referred to as a hybrid reality that could encompass both of the other technologies. The Microsoft HoloLens is a great example and this technology is the merging of real and virtual worlds. The latest episode of Stories by Onlim is on all three immersive technologies and the final interview is with Rick Barazza who works with Microsoft and was part of the development team on the HoloLens. 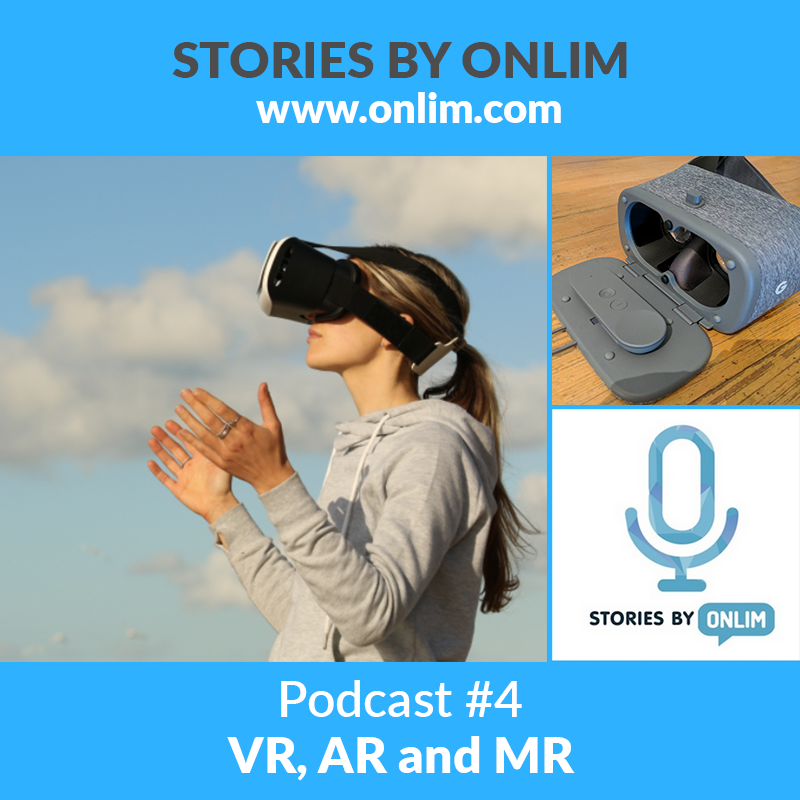 Hear more about the basics of all these technologies as well as the amazing applications they are being used for in Stories by Onlim Episode 4: VR, MR & AR. Get involved in the conversation. Tweet us @onlim_com and use the #stories. If you like the podcast leave us a review on iTunes or your podcast app, it helps others like you to discover the show. We started using Onlim, and we love it!